This is the full and detailed views of the cover of the first British edition of Sacred Clowns. This copy was published in 1993 by Michael Joseph LTD in London, England. Michael Joseph Ltd is an imprint of PenguinGroupUK that publishes highly commercial popular fiction and non-fiction and Top Ten Bestsellers. This is the first British version of this novel published. Design and Photography Credits: The cover illustration by Janet Pontin. 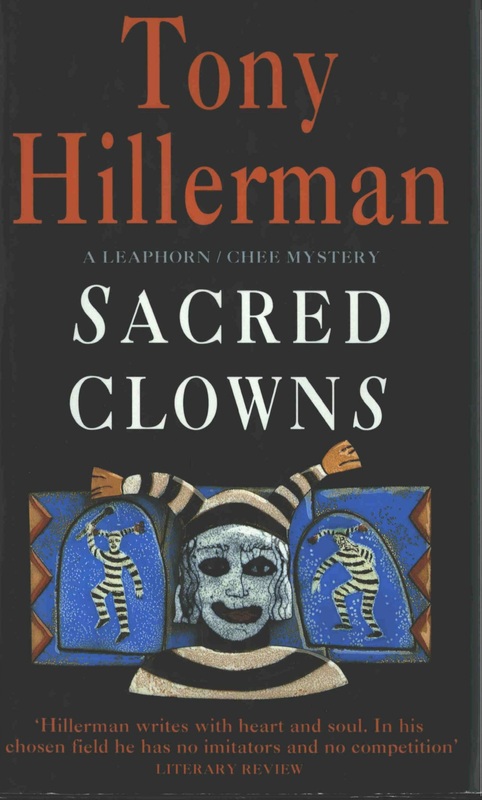 The cover depicts the figure of a sacred Pueblo clown with a tiled background featuring various other clown figures. Under the cover art there is a short quotation from a literary review. The front fold out contains a brief synopsis of the novel and the back fold out contains a miniature biography of Tony Hillerman.